On a KBS2 broadcast in the early morning of the 24th called ‘MV Bank2-Stardust’, Seung Gi’s MV ranked #1 on a chart titled ‘MV Chart 7’ for the 4th week of June. So happy to hear this good news after the unfortunate incident with the damaged film. It just goes to show a one minute video from Lee Seung Gi is powerful enough to outrank any full length MV. Congratulations, Seung Gi! Categories: Audio/Album, Music Video, Official Music Video, Video | Tags: 6th album, And Goodbye, And Goodbye MV | Permalink. Categories: Audio/Album, Music Video, Official Music Video | Tags: 6th album, And Goodbye, And Goodbye MV, Dispatch, Starcast, title song | Permalink. Categories: Audio/Album, Music Video, translation, Video | Tags: 6th album, And Goodbye, English subbed, Official MV, sgsairl, Starcast, video, video message | Permalink. There is an English translation of an exclusive Dispatch article that covers the story of Seung Gi’s MV filming for “And Goodbye”. Although it’s a bit awkwardly translated, with some parts either being completely omitted or mistranslated, it will help you to get the big picture of what the official MV would’ve looked like if the film hadn’t been damaged. The original Korean article was published around 1pmKST today and I tweeted translations highlighting the main points. I am a bit disappointed to see that the English version of the article misses some of these points. I will post the link to the English article here along with a compilation of my tweets from this afternoon. SG on explosion scene: please look forward to it. Also CG scenes. Heart-wrenching breakup scene w/ model in front of blue screen. LSG had stoic expression portraying the heart of a man who has to leave his love. With slight tears in his eyes, looks seriously at model. That day, Seung Gi was filming greetings for his fans. He even took a selca. Thank you Dispatch for giving us an inside look at what we could’ve seen and the hard work Seung Gi & staff put into the MV. My heart aches. Categories: article, Audio/Album, filming, Music Video, Official Music Video, translation | Tags: And Goodbye, And Goodbye MV, damaged film, Dispatch, Dispatch MV, Starcast | Permalink. Categories: Audio/Album, filming, Music Video, Video | Tags: And Goodbye, And Goodbye MV, Dispatch, MV by Dispatch, naver Starcast MV, Starcast MV | Permalink. Categories: Music Video, translation | Tags: English subbed, Let's Break Up, MV, video | Permalink. The same person who has been posting photos of Seung Gi’s MV set up close and personal uploaded this photo online around 10:09pmKST. 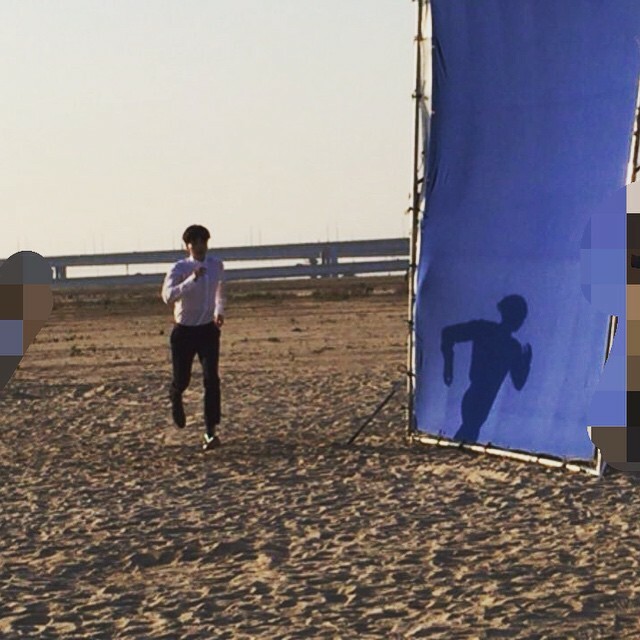 From the Chinese comments on her SNS, it appears that this was taken when Seung Gi was filming a separate greeting video for his Japanese fans on his MV set while filming the official MV. Categories: Audio/Album, fanpic, Instagram, Music Video, Official Music Video, translation | Tags: 6th album, fanpic, MV set, spoiler | Permalink.